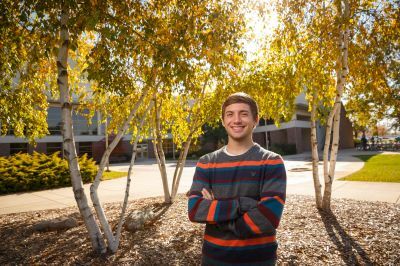 Stefan Baumgartner, a music and sociology double major from Goshen, believes in social justice. Before graduating in 2015, he found that GC also shares his drive for open conversation. I grew up going to Silverwood Mennonite Church in Goshen and I felt a strong connection to the Mennonite faith and Mennonite colleges. I picked Goshen because of the fantastic music facilities in the Music Center and the strong music department. How has your faith changed? Goshen has strengthened my faith by encouraging me to look for God in all situations and disciplines. I came into college as a very internally spiritual person, but Goshen has provided a place for me to express my faith more openly in fellowship with others. I am currently double majoring in sociology and music in hopes of going to graduate school for music therapy. I understand that my journey might not take me in that direction, but I know that God will use me wherever I go. I enjoy sociology and music separately as well, so there are many options to listen to God’s call. Obviously there are many differences between Goshen and huge state schools, but I think it also differs from other liberal arts colleges. It is a small campus with a relatively small student body, but the relationships I have experienced with friends, peers, faculty and staff have been incredibly enriching. GC has a strong peace and justice focus and is intentional about diversity issues.